Skill, determination, stamina and bravery ensured that a body boarder in severe difficulty was rescued. This incident took place at approximately 1630 on 8 August 2016 at Croyde beach in North Devon. A wide sandy beach, Croyde is popular with swimmers and surfers and is considered one of the best surfing beaches in the UK. The surf that helps make the destination so popular also creates a dynamic and sometimes dangerous leisure environment. It was a sunny day with a brisk north-westerly wind (force 4) and a 5-6ft challenging ‘messy’ surf with rip currents on both sides of the patrolled zone. At 1600 one of the Lifeguards, Sean Deasy had been tasked to carry out water patrols on the Rescue Water Craft (RWC) and was actively patrolling the rip currents on either side of the flagged patrol zones. At approximately 1630 Senior Lifeguard Freddie Hedger elected to go on water patrol using a rescue board (a form of extended surfing board). He made his way to the southern end of the rip current and entered the water. On his way out he teamed up with Sean to help clear the area of novice surfers, who were drifting out of the black and white flags and into the southern rip current. At this time Freddie became aware of a surfer and body boarder further out to sea, both of whom appeared to be in some difficulty. He immediately informed Sean, who made his way towards the two casualties on the RWC, closely followed by Freddie on the rescue board. Both lifeguards witnessed the surfer physically struggling with the sea conditions and he was clearly frightened. He had stopped helping the female body boarder who was with him and she was now in serious trouble. Sean attempted to grab the woman but had some difficulty getting close enough to rescue her with the RWC due to the large surf, which was breaking heavily on the sand bank. Freddie was on scene quickly and made the decision to leave his rescue board and swim to towards the female casualty in order to assist with the RWC recovery. On his arrival he found her face down and unconscious. Freddie lifted her face out of the water to allow her to breathe and worked hard to protect her from the waves that were continually breaking over both of them. On one pass the RWC driver witnessed Freddie and the casualty get dragged under by a wave, disappearing from sight in the aerated and turbulent water. As Freddie struggled to keep the woman afloat against the surf, the RWC made further attempts to rescue the pair but was hampered by the waves and undertows. Despite his exhaustion, Freddie managed to grab the handle of the rescue sled (at the stern of the RWC) with one hand. Using his other hand to hold the casualty’s head above water, he signalled to Sean to drag them along as he did his best to keep them both afloat. Close to complete exhaustion, Freddie and the casualty were towed approximately ten metres before he could hold on no more. Fortunately, the tow had by then taken them closer to the beach and, as they slipped from the back of the sled, Freddie could now touch the bottom. At this point he signalled the RWC to return to shore and ready the casualty care pack. The casualty was unaware of what was happening around her and unable to help. Freddie started to make headway and, as he got to waist depth, a member of public came to his aid, closely followed by Sean. Once ashore the casualty, who was barely conscious, began vomiting and was clearly in a bad state. Both an ambulance and helicopter were called to the beach. 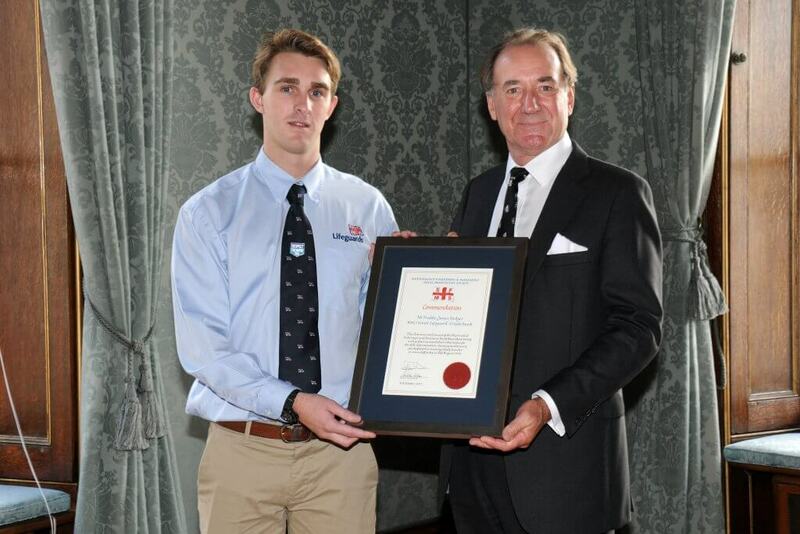 As senior lifeguard on the beach Freddie’s presence of mind and leadership were crucial in helping other emergency services with the rescue. Despite his exhaustion Freddie stayed with the casualty as she was taken to the top of the beach where she was handed over to the ambulance crew and spent a night recovering in hospital.